Makita DTM50Z 18V Cordless Multi Tool 5ah 4ah Battery. Condition is Used. Dispatched with Royal Mail 1st Class. With up to 20,000 oscillations per minute the DTM51 has a high operational efficiency which enables it to cut through most materials with ease. 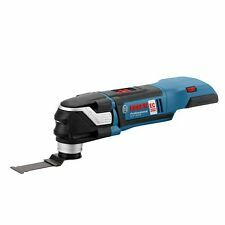 Accepts OIS Makita, Bosch & Fein accessories, including Starlock. 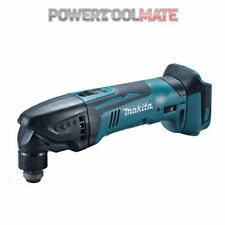 Makita DTM50Z 18V Li-ion Cordless Oscillating Multi Tool Body Only. Condition is used. In good clean working condition. Flexible battery system: works with all Milwaukee® M18™ batteries. Unique cutting depth stop adaptor to prevent over-cutting in material. Power Tool Accessories. Productivity enhancing FIXTEC tool free blade change with universal blade change adaptor included to accept all competitor blades. BOSCH GOP 18V-28. 18V LI-ION BRUSHLESS STARLOCK MULTI TOOL. The cordless powerhouse with fast accessory changes. 3D interface for low-loss power transfer from the tool to the accessory. StarlockPlus category tool ensures a faster work rate. Makita DTM50Z 18v LXT Cordless Cutter Body Only. Makita Part Code:DTM50Z. ModelMAKITA DTM50Z Multi tool 18v Body Only. Accepts Makita, Bosch & Fein accessories, including Starlock. Supplied as body only. Bosch GOP 10.8 V Cordless Brushless Multi Tool No Batteries. Condition is Used. Dispatched with Royal Mail 1st Class. 18V XR BRUSHLESS OSCILLATING MULTI-TOOL BARE UNIT. 1 x 31 x 43mm Wood with Nails Blade. Sound Power Uncertainty 3 dB(A). Sound Power 97 dB(A). Sound Pressure Uncertainty 3 dB(A). Sound Pressure 86 dB(A). Flexible battery system: works with all Milwaukee® M18™ batteries. Blade, sanding pad, UL blade adapter, blade adapter, clamp shaft, 5 x sanding paper. 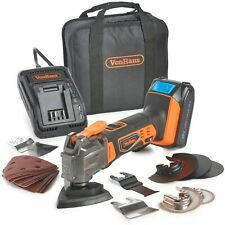 Unique dust extraction kit to keep the work space dust-free when connected to an AC or DC extraction system (sold separate). RYOBI 12V CORDLESS MULTI TOOL. This tool is part of the Ryobi 12v range, small in size big on performance, making these tools handy and compact but still ready to tackle most tasks. This handy multi tool is the perfect tool for sanding difficult areas, cutting intricate hard to reach surfaces safely, and is an essential all-rounder for DIY. 12v Parkside Cordless multi tool with battery. Condition is New. Dispatched with Royal Mail 1st Class. 12v Parkside PAMFW 12 B2 Cordless Multi Purpose Tool + Battery + Charger + Case! Parkside 12V multipurpose tool. - Delta sanding plate. - LED work light. - Versatile tool for sawing, cutting, scraping and sanding. - 6 sanding sheets. It is designed for multi functionality. The Einhell TE MG 18 LI Cordless Multifunctional Tool has a quick release and magnetic tool fixation so that accessories can be changed without tools. Speed electronics and constant electronics enable the tool to be adjusted to the particular material with no loss of speed. The item you are currently viewing is the Milwaukee C12MT-0 12v Compact Cordless Multi-Tool - Naked - Bare Unit. Compatible: M12 LITHIUM-ION System with over 25 cordless tools. Variable Speed Dial: Match speed to application. Ryobi ONE RMT1801 18V Cordless Sanding & Cutting Multi Tool (Body Only). Condition is very good only used once to remove tile grout. Dispatched with Royal Mail 2nd Class. Makita DTM50Z 18V Cordless Multi Tool in good condition has had new gearbox fitted by Makita service agent. Makita DTM50Z 18v li-ion cordless multi tool, naked - body only. The quick-release, magnetic tool fixation ensures that accessories can be changed without tools. Speed electronics enables the tool to be adjusted to the particular material. For comfortable operation there is a soft grip. DEWALT DCS355 18V XR Cordless Brushless Oscillating Multi-Tool - 2015 MANUFACTURERS 1x battery 4.0Ah REPLACEMENT Condition is Used. Dispatched with Royal Mail 2nd Class. Makita DTM51Z 18V Li-ion Cordless Oscillating keyless Multi Tool Body Only. Condition is Used. Excellent condition used only few times. £0.99 start auction NO RESERVE!! Includes DeWalt DCB18218v 4.0Ah with LED indicator.